PRICES MAY CHANGE, YOU NEED TO UPDATE THE OPERATOR'S INFORMATION! 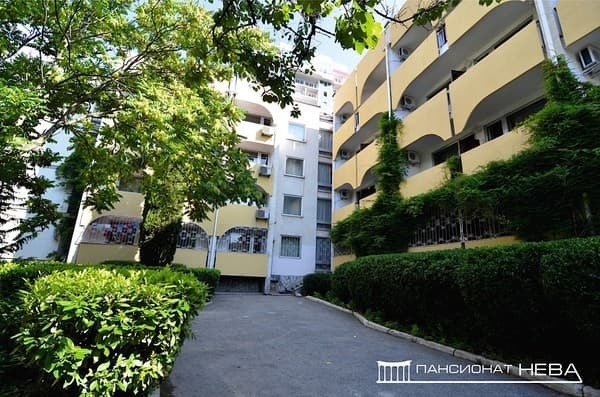 The boarding house "Neva" is located in the central part of the city. 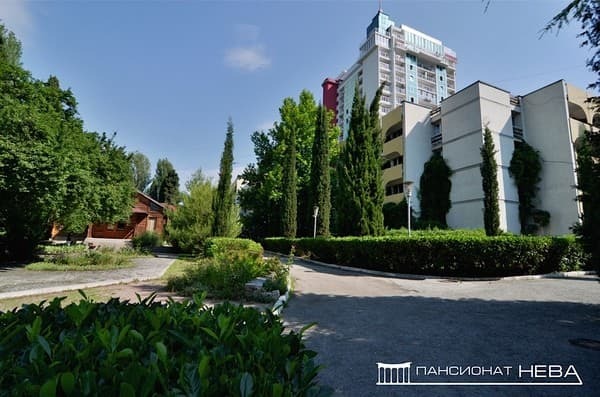 Alushta, next to the beautiful park zone and stadium, 200 meters from the sea shore. The hotel has three maps of its own pebble beach equipped with a total length of 180 m, as well as its own dendrological park with the richest collection of relic plants located on the territory of more than 4.5 hectares. 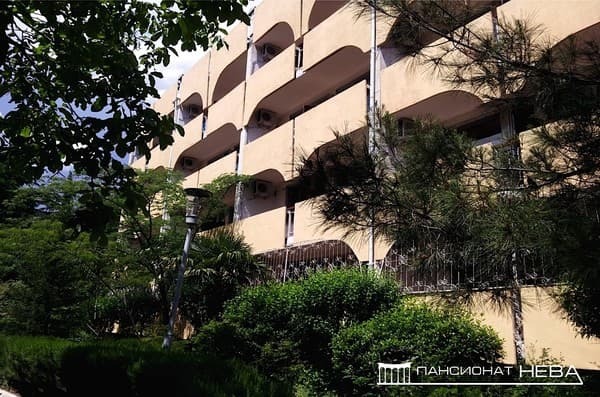 The room fund of the boarding house "Neva" consists of 130 rooms of various categories. All rooms are equipped with air conditioning, balcony, refrigerator, cable TV, wi-fi access. 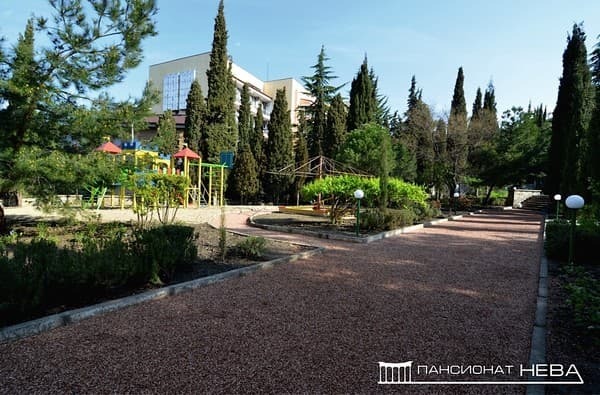 On the territory of the boarding house "Neva" there is a playground and a family-playing complex with slides, carousels, sandboxes. The hotel offers a conference hall, horse and sea walks, rent of inventory for water activities and beach umbrellas, secure parking. Guests can also visit the "Sound" club on the waterfront free of charge. The dining room of the boarding house "Neva" is located in a separate air-conditioned building from a wooden frame with an open summer terrace overlooking the mountain river Demerdzhi. Meals three meals a day on the "buffet" (it is possible to organize dietary meals). There is a 24-hour sports bar on site. Distance to the bus station - 3 km, Simferopol - 49 km. Description of the room: One-room double room with a total area of ​​16 sq.m with two single beds. The room is equipped with all necessary furniture for a comfortable stay. 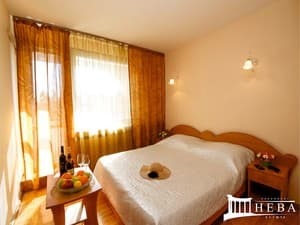 Description of the room: The room has a total area of ​​16 sq.m with two single beds or a large double bed, complete with all necessary furniture. The rooms of this category are located in the 1-st and 2-nd buildings, on the 1st-4th floors. Description of the room: One room with two single beds or a large double bed. Room is equipped with all necessary furniture. Possible extra space. The rooms of this category are located in the 1-st building, on the 2-nd and 3-rd floors. Description of the room: Two-room suite with a total area of ​​21 sq.m consists of a living room and a bedroom, complete with all necessary furniture. Rooms of this category are located on the 2 nd, 3 rd and 4 th floors in two buildings. Description of the room: One-room spacious room with a beautiful view of the city and the Crimean mountains. It is located in a three-story building. The room is equipped with a double and single bed, an armchair, a convenient wardrobe, a coffee table. The room has a large furnished balcony. Description of the room: Two-room suite with a total area of ​​28 sq.m, 4 single beds, two separate bathrooms. The mandatory equipment includes two wardrobes. Each of the rooms has a private balcony with views of the park and the mountains. Children under 5 years old are accommodated free of charge with their parents without providing a separate bed. The cost of a voucher for children from 5 to 7 years, not occupying a bed, with the provision of three meals a day according to the "buffet" system is 196 UAH / day. The cost of a voucher for children over the age of 7 years, located in the main place, is paid in full. The cost of extra space is 604-783 UAH depending on the season. The guest house is located in the central part of Alushta, next to the park zone and stadium, 200 meters from the beach. The bus station is 25 minutes walk (3 km), the center - 10 minutes walk. The distance to Simferopol is 49 km. From Simferopol to Alushta, trolleybuses No. 51, 52. From the bus station you can get by bus No. 8, 7, 4, 26 or by taxi.